We mean wheat or your garden variety grass, of course. 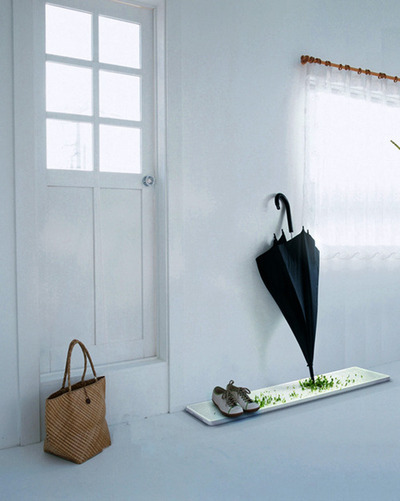 From the mind of Junjie Zhang, a true eco-conscience genius, comes an awesome facilitation of simple indoor gardening. Ancient Chinese philosophy states that respecting the principles of nature is paramount to human survival in this world. Those currently living in heavy storm zones can do just that by still enjoying a bit of the outdoors all the while staying dry indoors, thanks to the coolest umbrella stand we’ve ever seen. The trick is the specially woven fabric that houses the seeds combined with the mesh pattern that increases the umbrella tip’s friction as well as providing air and light for the seeds to grow. Depending on how often your umbrella gets wet, the plant’s growth patterns will change according to the behavior and activity. The rain from a single umbrella placed down once can provide enough water to keep the plants alive for 5 days. For all you Seattle folk, you may never have to water them at all. For those in Phoenix, you made need to grab a watering can weekly but how lovely would it be to come home to a fresh plot of green all in the comfort of your air conditioning? Pretty spiffy if you ask us. Just yet another way to cohesively live with plant life all while giving Fluffy a endless supply of Kitty Grass. Now that’s some super easy yet highly beneficial repurposing done right.